No more blank page problem when creating a new space! The new Space Blueprints will give you a frame by adding a specific homepage and sidebar and integrated Blueprints for your pages atomatically. So you can start filling the space with content immediately. Knowledge Base Blueprint: It has never been easier to build a central knowledge base for a team or project. With the new "Knowledge Base" Blueprint you start with a homepage and blueprints for tutorials and so on. Arrange the space by adding labels and organizing pages in topics. 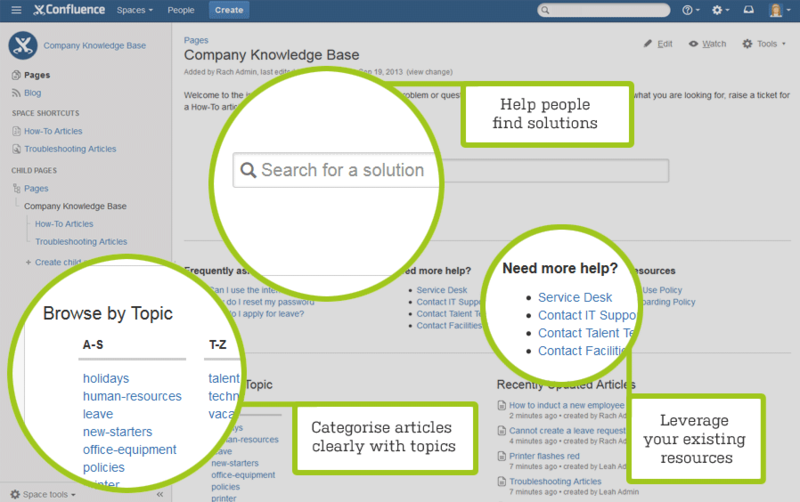 The knowledge base’s search is customized to only include the pages of that specific space. 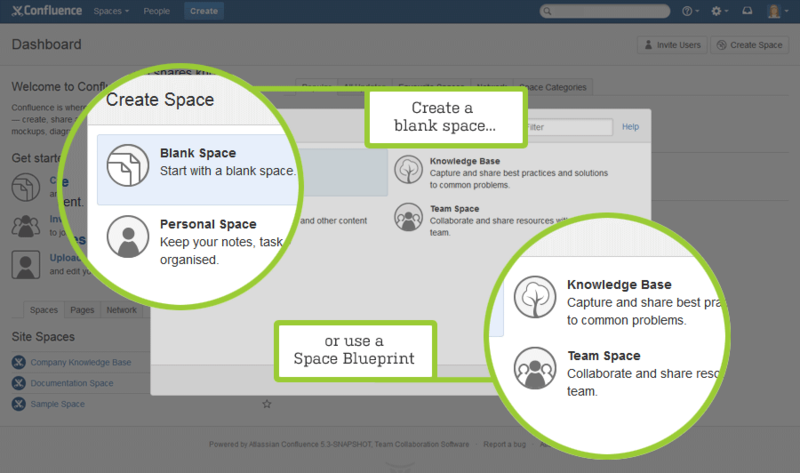 Team Space Blueprint: Create a team space and start with a specific homepage, a team overview, and a team blog. Just choose the "Team Space" Blueprint and select your team members. After that, those people get notifications and the permissions for that space and will be integrated in the homepage and added as watchers. It’s common to share and discuss interesting links by email. But lengthy email threads with feedback and discussions are neither efficient nor centralized, or searchable and easy to find. Confluence 5.3 ships with a new Page Blueprint "Shared Links". You want to share an interesting article or video with your team? Use the Blueprint, select a space and a title, add a comment and choose the team members you’d like to involve. Within seconds you have a clear page with a preview of the content where you can discuss the link by using comments and likes. It’s even easier to share links from your browser tools. Just drag a bookmarklet into your browser’s bookmarks bar. 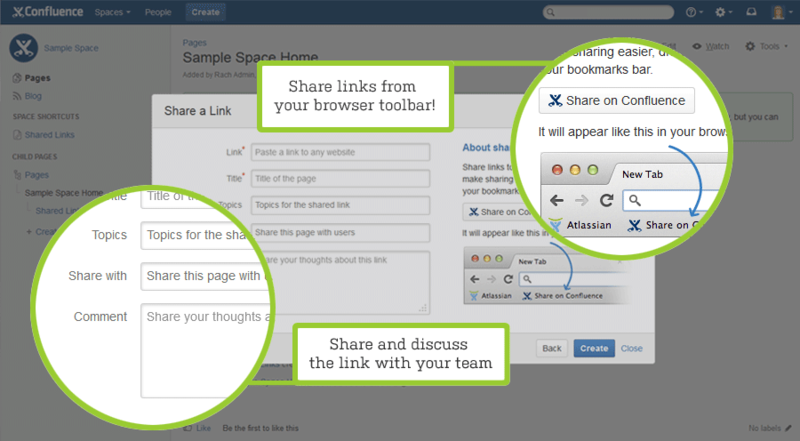 If you come across cool content just click the "Share on Confluence" button to open the dialog. A colleague has sent you a link to a Confluence page but you don’t have the permission to read it? You don’t have to send emails back and forth anymore. Now you can apply for the permission from within Confluence. A user who can give you the permission will be notified by Confluence and can give you access with a few klicks. After that, you will get a notification, that’s it. Now you can edit user names of Confluence users. You can choose if you want to display the child pages or the whole page tree in the sidebar. Restrict Live Search to specific labels or content types. In addition you can choose to display further information like excerpts together with the search results. Choose to display a single JIRA issue with or without summary. Better usable whitelist UI: The existing whitelists for gadgets and macros are now combined. //SEIBERT/MEDIA is your Confluence partner! Do you have questions on Confluence and social intranets? Are you evaluating promising software? Do you need support with an up-and-running Confluence project? We are one of the biggest Atlassian partners worldwide with sites in Germany, Australia and the USA, and would be happy to consult with you, so please contact us.